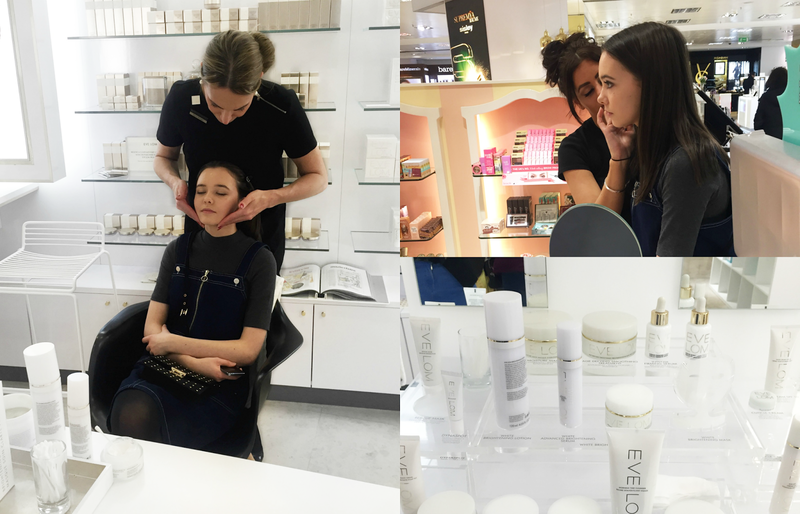 My first stop was at the Fragrance counter where I had a consultation and discovered lots of new launches. I found out about some fairly new lines (compared to most perfume brands) such as Juliette Has A Gun, Maison Francis Kurkdijan Paris (the man behind Jean Paul Gaultier, Elie Saab, Burberry - just to name a few), Creed and Heeley. I took home some samples so I can try them out for myself. I found it really hard to pick a favourite because all of them smell so unique! 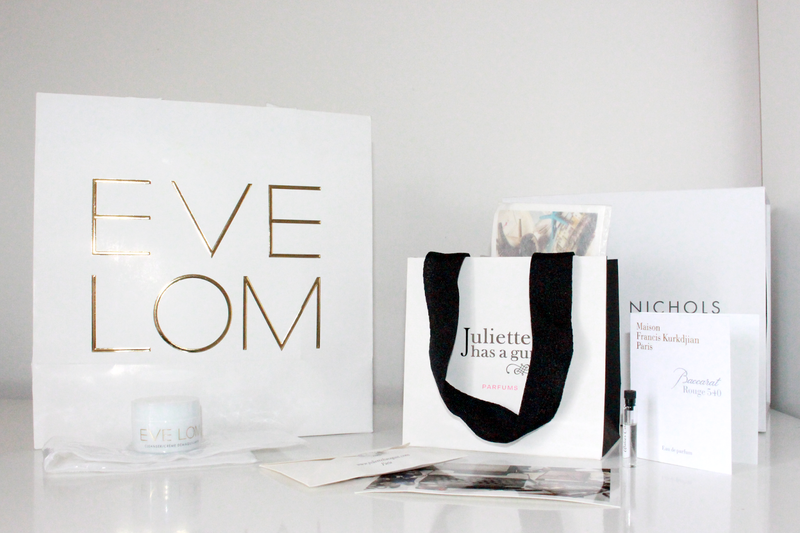 After this, I went to Eve Lom which is a gorgeous skin care brand. I was really excited to learn more about their products as I have heard of them before but never tried for myself. I am also focusing on my skincare at the moment - it is so important! The lovely, Julia, gave me a facial using their iconic cleanser. It deep cleanses the skin, removing all make-up (even waterproof), it also has small bits and a texture which exfoliates the skin. You use the muslin cloth that it comes with to steam and then massage the cleanser in to your face - it tones so you don't have to use a seperate toner! She then applied the advanced brightening serum and moisture mask. My skin has never felt or looked better! I'm really excited to try out the samples in my every day routine to see if I can see an improvement! Lastly, after getting a relaxing facial I went to the Benefit Cosmetics counter and had my face put back on by the beauty artist, Hayley. She primed my face with the POREfessional matte rescue, I understand why this is a bloggers favourite because my skin looked so much better and shine-free. 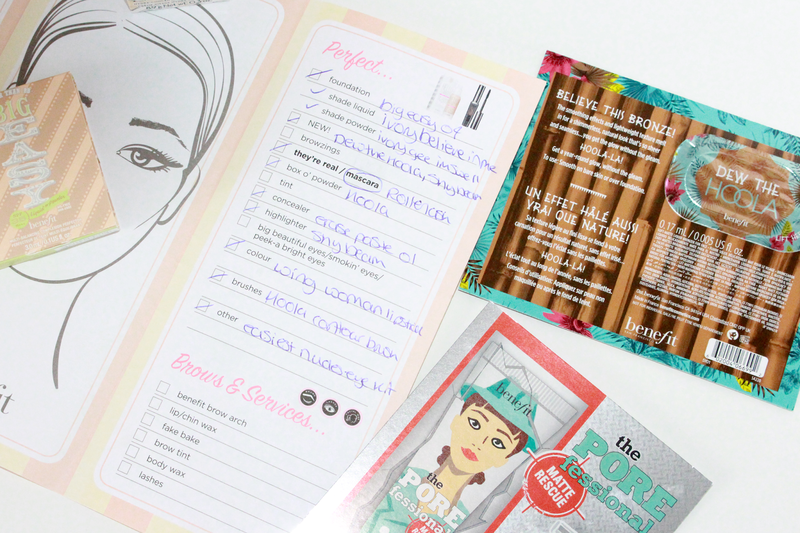 I also tried the new Dew The Hoola Bronzer and Shy Beam - they looked amaze. I took an image of all of the products she used if you're interested. I had so much fun trying out all the brands and taking home samples to try for myself, it's great that I can find new brands that I haven't tried before and seeing which ones I like. A shopping spree definetly needs to planned! 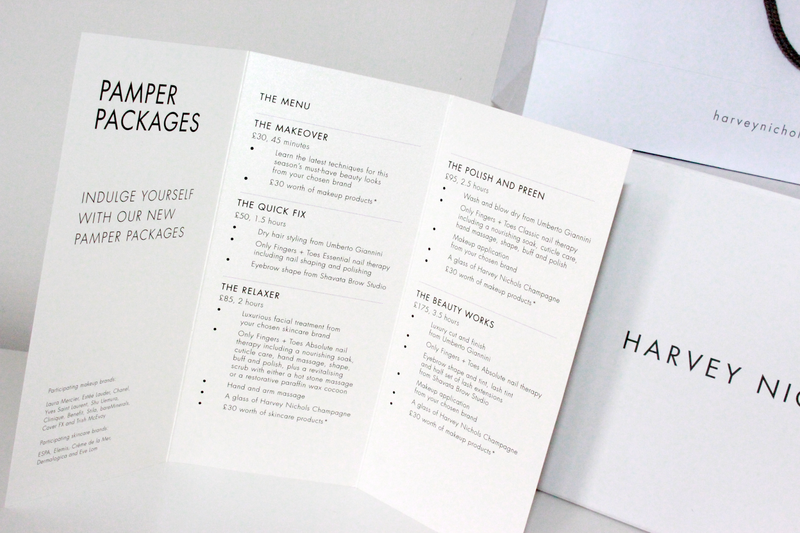 The pamper packages at Harvey Nichols also look amazing. I really want to book one in with some friends so we can all go out and indulge in some beauty treats. For just £50 you can get a dry hair styling at Umberto Giannini, Only Fingers & Toes Essential nail therapy including nail shaping and polishing and eyebrow shape from Shavata Brow Studio!! You can see a picture above of the menu to see what else they offer - I think they would be great for birthdays! P.S I hope everyone had or is having a lovely Easter holiday!! ooh wow I had no idea how much you would get for your money here! this sounds fab!